"When nothing worked, they started abusing development. Who says villages don't need roads, slums don't need medicine, children don't need education or youth don't need jobs? How will this happen without development? They are addicted to corruption. Can these people help Gujarat? I believe in the people of Gujarat," said Modi. Modi says Congress has never fought elections on the issue of development. They have always fought on communal issues. "I had hoped that this time they would take the BJP's challenge of fighting on the issue of development. But they have not done so," he added. Party president Amit Shah told the crowds that a two-thirds majority which the BJP had been getting under Modi’s leadership was not enough. “We want a victory by three-fourths majority. When Modi was chief minister, we got 127 seats. Now when he is prime minister, this figure looks too small,” Shah told thousands of party workers in Ahmedabad. Narendra Modi and Amit Shah have arrived at the venue in Gandhinagar amid chants of "Modi, Modi". He was welcomed by Gujarat chief minister Vijay Rupani with a Gujarat-shaped garland. Social media blitzkrieg in Gujarat under the theme, Vikas Gando Thayo Chhey (Development has gone bonkers) and Maara Haara Chhetri Gaya (They took us for a neat ride) are taunting at the development claims of the state and Central governments. The Guajrat chief minister also denied the allegation that the BJP government was interfering with the Election Commission's decision to announce poll dates for Himachal Pradesh but not for Gujarat. Saurashtra is like Uttar Pradesh of Gujarat for it sends the maximum number of MLAs, 52, to the 182-member state Assembly and is the BJP’s bastion for two decades. Congress getting an unusually positive response to Gandhi in this region is a matter of concern for the BJP, which depends completely on the persona of Modi. Shah also enumerated various achievements of the BJP-led governments in the state. He compared the situation in Gujarat in 1995, when the BJP wrested power from the Congress, to what the state achieved till 2017 in power generation, farm production, education, police modernisation and road construction. BJP chief Amit Shah accused three generations of the Congress party of having "insulted" Gujarat. "Rahul Gandhi comes here and seeks answer from us as to what has the BJP done for the state. We are seeking an answer from you (the Congress) for injustices that the three generations of your rule did to us," the BJP president said. Hitting back at the Congress, Gujarat chief minister Vijay Rupani on Sunday accused the opposition party of having influenced the Election Commission's announcement of Gujarat Assembly poll dates in 2012. In 2012 (Assembly election), the Election Commission ensured at the behest of the Congress that the model code of conduct was in force for a record time to prevent Modiji from working, because of which the state government could not take up development work," Rupani said at an election programme organised in Ahmedabad by news channel India TV. Modi inaugurated the Rs 500 crore GMERS medical college and also interacted with the medical students in the classroom. Modi also visited his school where he knelt and touched his forehead to the ground. The prime minister also offered prayers at the Hatkeshwar Mahadev Temple in Vadnagar. Are Modi's frequent visits a sign of BJP's nervousness? The ruling BJP’s nervousness is clear from the fact that this is Narendra Modi’s fourth visit to Gujarat in four weeks and eighth this year, which were all marked by announcements and a series of foundation-stone laying ceremonies of ambitious projects. In all, the Prime Minister has come calling to his home state 18 times on official events since he assumed charge in the national capital. 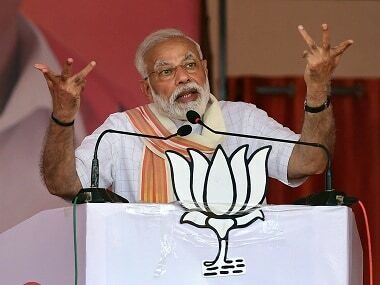 In a no holds barred battle, where the opposition Congress is for the first time putting up a semblance of a fight in the last 22 years, Narendra Modi remains the last ray of hope for the embattled BJP, which is for the first time facing the electorate without Modi as the chief minister. 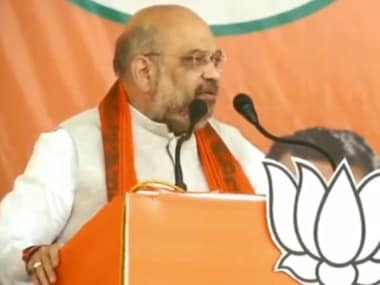 Shah expressed confidence that the BJP would get "three-fourth majority" in Gujarat this time, and "will form a government under the leadership of Vijay Rupani". Shah also ruled out possibility of any "third alternative" in Gujarat. "After 1990, the voters of Gujarat had been consistently voting in favour of BJP both in the assembly and Lok Sabha elections. There are only two main parties - BJP and Congress. There is no third formation in existence." On Rahul Gandhi's recent remark that it was "shameful" that Sardar's statue was being made in China, Amit Shah snapped back: "The world's tallest statue of Sardar Patel will be erected in Gujarat. People of Gujarat will not tolerate Rahul Gandhi for this joke. The voters of Gujarat will give a stinging reply to this joke." Ahead of his visit to home state, Narendra Modi tweeted that he will fulfill the dreams of every Gujarati. Prime Minister Narendra Modi will address the gathering of over 7 lakh party workers at around 3 pm on Monday. He will speak at the Gujarat Gaurav Mahasammelan, which is being organised at the conclusion of the Gujarat Gaurav Yatra, which began on 1 October. Gaurav Yatra a response to Navsarjan Yatra? According to The Hindu, BJP launched the Gujarat Gaurav Yatra in response to Congress' 'Navsarjan Yatra'. According to the report, the Navsarjan garnered impressive support from the rural population in Saurashtra during Rahul Gandhi's three-day stay in the region. What's Gujarat Gaurav Yatra all about? 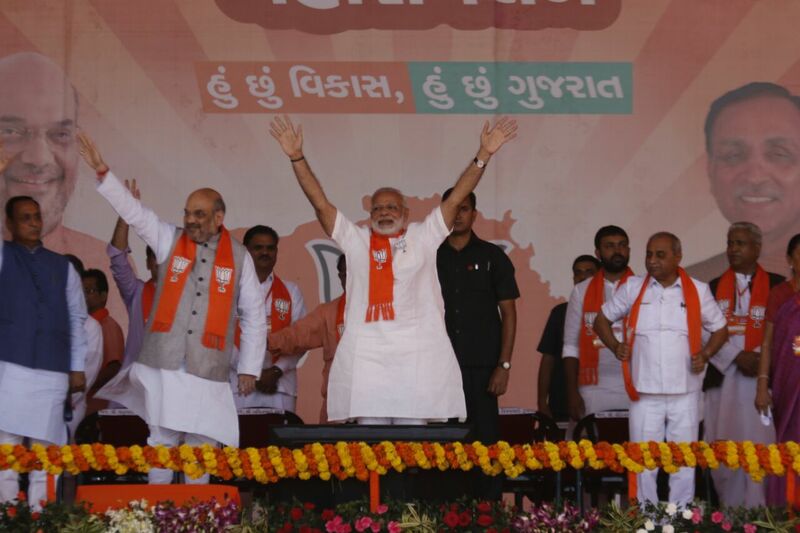 BJP's Gujarat Gaurav Yatra, comprising of two raths (chariots), of which the first one kicked off from Karamsad, the birthplace of Sardar Patel in Anand on 1 October, and covered 1361 kilometres and 76 assembly constituencies in Central and North Gujarat regions. The second started its journey on 2 October and travelled a distance of 2395 kilometres covering 73 assembly seats in Saurashtra and South Gujarat. Gujarat chief minister Vijay Rupani, BJP national president Amit Shah and many other leaders of the party would also be present on the occasion, BJP state unit chief Jitu Vaghani told PTI. Senior leaders of the party joined the 15-day march, which was launched on 1 October. The march covered a distance of around 4,471 kilometres, spread over 149 of the 182 Assembly constituencies in the state. Why is the Mahasammelan being organised? The 'Gujarat Gaurav Mahasammelan' is being organised by the state BJP to celebrate the conclusion of the saffron party's 'Gujarat Gaurav Yatra' (march for Gujarat's honour) on Sunday. The prime minister will address around seven lakh BJP workers at the Gujarat Gaurav Mahasammelan to be held in Bhat village, which is located in the outskirts of Gandhinagar. 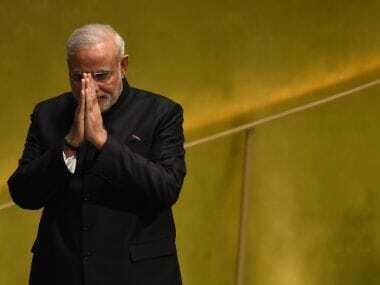 Modi wishes the people gathered on Diwali and Dhanteras, finishes speaking. Modi said that all hurdles on GST will be resolved. Congress and other state government too were involved in the decision-making process. He also defended the demonetisation move by saying that the nation has been freed from black money. He said that 8 November will be remembered as anti-black money day. PM attacks the Gandhi family and says they have always insulted non-Gandhis. They don't like Gujarat and Gujaratis. When Morarji Desai became PM, they spread rumours about what he drank and what he didn't. They didn't talk about his ideals, about his dedication to Mahatma Gandhi's cause. Talking about the Narmada project, he says that every child in Gujarat knows how much we suffered for the Naramada project. 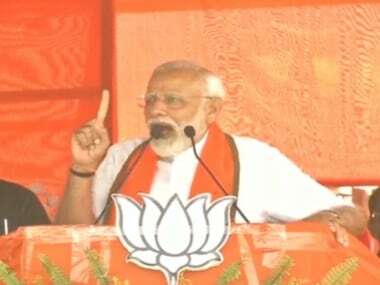 Narendra Modi compares elections to "yagya"
Modi said, "I recognise the power of the BJP workers. I know how much you have suffered. There is no greater fortune than the love which you have bestowed on me." He goes on to say, "When I was asked to come on the 16th, I said that Diwali is the biggest festival in Gujarat, will people come for the rally? 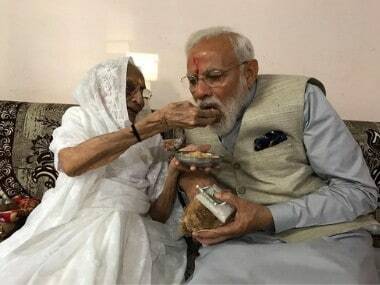 Everyone said, Modibhai you just come. I can see the result here. I have never seen such a big collection of BJP workers at one place." "In a democracy, elections are a yagya. All soldiers of democracy must use that yagya to do more good. However, since the ages of Ramayana and Mahabharata, we have seen that when there is yagya, there are always those who try to cause problems," he said. Shah attacks Rahul Gandhi, says Gandhi couldn't even build a Collector's office in Amethi, but now questions the BJP's work in Gujarat. He further adds that the people will give the answer. BJP president Amit Shah starts speaking at the Gujarat Gaurav Mahasammelan. Former Gujarat chief minister praises the Narendra Modi - Amit Shah duo for the work they have done. Says the party will continue to work for development. Rhetoric will rain down on Gujarat, Congress vice president Rahul Gandhi said in a "weather report" ahead of Prime Minister Narendra Modi's visit to his home state on Monday. Rahul's dig comes in the wake of speculation that the prime minister may announce a host of sops for poll-bound Gujarat. The Congress vice-president also tagged a report headlined "As Gujarat waits for poll date, state gets projects worth nearly Rs 12,500 crore" with his tweet. 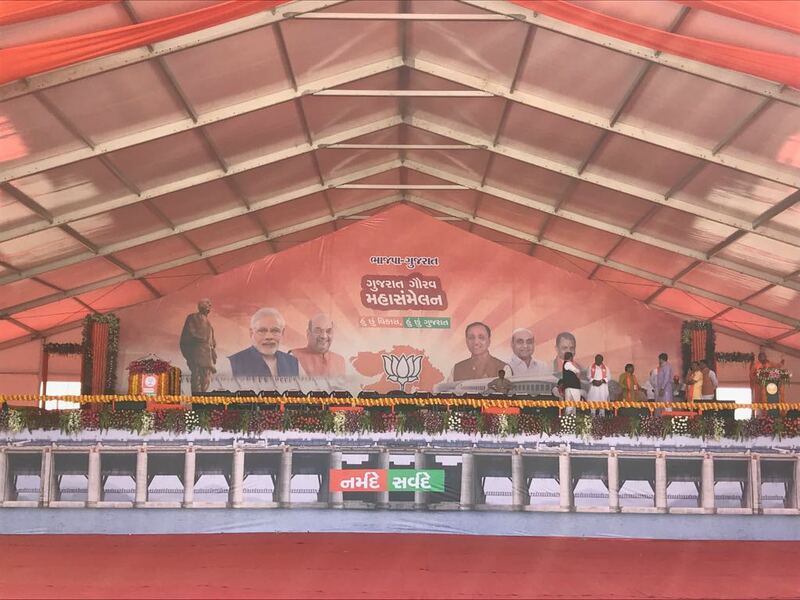 The BJP’s mega show on Monday afternoon will be held on a five lakh square metre land near Bhat village on the Ahmedabad-Gandhinagar village and there are as many as 26 entrances to the venue. The main podium has pictures of the proposed Ahmedabad-Mumbai bullet, the Statue of Unity of Sardar Patel and the Sardar Sarovar Narmada Dam. The BJP has created a parking facility for 15,000 big vehicles and 7,000 small ones, while sitting arrangements have been made for seven lakh people. Four medical teams with over 50 doctors, four ambulance and medical vans each have been deployed, while 50,000 ORS kits have been kept handy. The event begins at 3 pm while Prime Minister Narendra Modi is expected to address the crowd at 4 pm. Gujarat Gaurav Yatras showcased the spirit of Jan Shakti & reflected Gujarat's strong faith in politics of development & good governance. The prime minister is scheduled to address a gathering at the 'Gujarat Gaurav Mahasammelan', which is being organised by the state BJP to celebrate the conclusion of the saffron party's 'Gujarat Gaurav Yatra' (march for honour) on Sunday, Gujarat BJP chief Jitu Vaghani said. Senior leaders of the party had taken part in the 15-day march, which was launched on 1 October. The march covered a distance of around 4,471 kilometres, spread over 149 of the 182 Assembly constituencies in the state, he added. "Tomorrow, the prime minister will give his guidance to around seven lakh BJP workers at the Gujarat Gaurav Mahasammelan to be held in Bhat village," Vaghani said. Gujarat chief minister Vijay Rupani, BJP national president Amit Shah and many other leaders of the party would also be present on the occasion, he added. Last week, Modi had visited Gujarat to inaugurate and lay foundation stones of various projects in Rajkot, Vadnagar, Gandhinagar and Bharuch. He had also held a roadshow in his hometown Vadnagar on 8 October. The Assembly polls are due in Gujarat later this year.